DOVER — The Delaware Division of Public Health and CVS Health announced today that the opioid overdose-reversal medication naloxone is now available without an individual prescription at all of the 20 CVS Pharmacy locations in Delaware, including those located inside Target stores. CVS pharmacists will be able to dispense naloxone to patients without an individual prescription under a statewide standing order issued by the Division of Public Health (DPH). In July, Governor Carney signed Senate Bill 48, which expanded community access to naloxone by ensuring pharmacists had the same legal protections as doctors, peace officers and good Samaritans. Pharmacists can now dispense the medicine responsibly without potential legal, criminal, or disciplinary actions due to injuries or death sustained in connection with dispensing the drug. Naloxone will be available at the pharmacy counter in participating pharmacies to anyone who is educated on its appropriate use and signs an acknowledgement form. 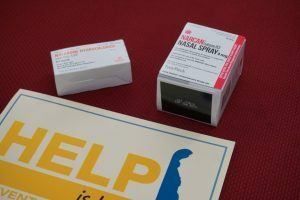 DPH hopes that this measure, in combination with a revised standing order allowing pharmacists to dispense naloxone nasal spray, will increase access for those concerned about someone at risk of an overdose. Overdose deaths in Delaware climbed from 172 in 2012 to 228 in 2015, and then jumped to 308 deaths in 2016. There have been approximately 190 suspected drug overdose deaths to date in 2017. First responders administered the life-saving medication naloxone more than 1,535 times in 2016 and 1,280 times in the first half of 2017. For more information about how to access naloxone at the pharmacy and to receive training on how to use it, visit HelpisHereDE.com/Get-Help/Overdose-Response. HelpIsHere.com is DHSS’ one-stop clearinghouse website for information on prevention, treatment and recovery resources in Delaware, and learning about the signs of addiction. Within three to five minutes after administration, naloxone can counteract the life-threatening respiratory depression of an opioid-related overdose and stabilize a person’s breathing, which buys time for emergency medical help to arrive. DPH recommends calling 9-1-1 immediately if you find someone in the midst of a suspected overdose, starting rescue breathing, and then administering naloxone. Naloxone is not a replacement for emergency medical care and seeking immediate help and follow-up care is still vital. For a list of permanent drug collection sites to safely dispose of unused prescription medication, visit permanent collection sites, visit DPH at http://dhss.delaware.gov/dph/hsp/hhdrugtakeback.html.